On October 2, 2017, as part of the Wellspring Literary Series, Tommye Blount visited Mount Pleasant. Kevin Thomas recently had the privilege of discussing with Blount his poetry via email. 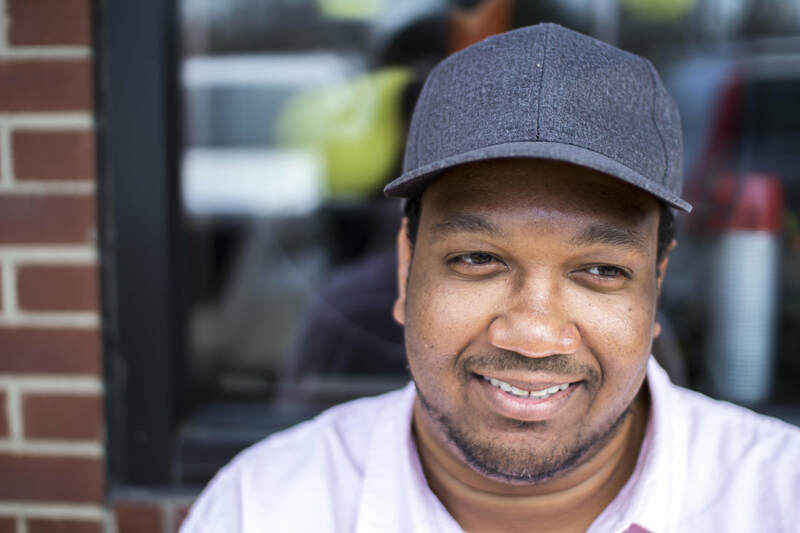 Blount is the author of a chapbook of poems called What Are We Not For, has received a 2017 Kresge Artist Literary Fellowship, and is working on a full-length poetry collection that will be published in 2020. His work has appeared in several journals, including: The New England Review, Poetry, The Poetry Review, Ninth Letter, The Kenyon Review, and Third Coast. His chapbook, What Are We Not For, can be purchased from Bull City Press. ​Kevin: What inspires you to write poetry? How did you start, and what keeps you going? Tommye: So, my initial answer might be very disappointing to you, but, as I have said in past interviews, it is the mere fact the page is blank that draws me back to write. That answer is still true, but I feel as if this is more a question of why poetry and not prose? I wish I could say that I always loved poetry from grade school, but that is not the case for me. Wow, I don’t think I’ve ever mentioned this before, but it was actually a social science course I took in undergrad that introduced me to poetry. The focus of the course was on the political 60’s. Part of the lectures focused on the Black Arts Movement. We were given a CD with folks like The Last Poets and Amiri Baraka. It was Sonia Sanchez’s strange-to-me musicality that caught my ear. “Summer Words of a Sistuh Addict” blew my mind. I had no idea that poetry could lift in the air that way. My early poems were terrible and I would mimic (so embarrassing to me now) Sonia Sanchez’s vocalizations at open mics around Detroit. I didn’t realize it until later, but in mimicking Sonia’s voice, I was attempting to find my own. I took a creative writing course, although I was an advertising major, and grew more comfortable writing. After that, without knowing who she was, I signed up for Diane Wakoski’s Intro to Poetry course. It was not until I met Vievee Francis that I began to take studying poetry seriously. For about four years, others can correct me on this count, Vievee took on me and a handful of other Detroit poets as students. She was, and is, tough. It was always about the work. Vievee taught me, and still teaches me, that this field is not to be taken lightly. Also, it was she who told me about Cave Canem and Warren Wilson College—both institutions to which I would later be accepted. Yikes, I am rambling. Right, why poetry and not prose? Blank page, yes, but there is more to this answer. Poetry can be a bit of a shapeshifting genre, don’t you think? With prose, I come to it as a reader expecting a narrative to be delivered in a way that has a beginning, a middle, and an end. Of course, this is putting things simply as narrative gets manipulated all of the time in some of my favorite pieces of fiction. But, I know what I am going to get. With poetry, particularly poetry that sits in the lyric mode, all bets are off. Poems that behave (formally speaking) in the manner of what they are speaking of or to, are of great interest to me. Nandi Comer, a poet and dear friend, is doing that kind of work in these bifurcated poems she calls syndromes. The poems juxtapose severely clinical prose with lyric, delivering an experience that goes beyond news or storytelling. In Nandi’s syndromes, one is not just a reader, but an accomplice in its making. You see? It’s this kind of dynamism that draws me to keep writing poetry. Kevin: Themes of bodies, body parts, and animals seem to emerge in your poetry. For example, “The Tongue.” Have you noticed this? Can you talk about this theme and how it functions in your work? Tommye: Of course, these motifs are intentional. One of my major obsessions is probing the disconnect between a body’s intention and the actions/gestures that intention manifests. What I mean to convey and how that conveyance is perceived are not always in agreement. Violence and pleasure spring from this space. Yes, the poems in What Are We Not For speak to the lengths men are willing to go in the name of desire. But, more than that, the book is concerned with that disconnect between intention and action. It’s why the chapbook has its gnarled title. Most people, I find, feel the impulse to “correct” the title into “What We Are Not For.” It’s that collision between the mind (intention) and the body (action/gesture) that is truly holding this collection together. Kevin: I’ve sensed a balance between seriousness and playfulness in your poetry. Could you talk about your writing process and perhaps how this blend of seriousness and playfulness emerges in your work? Tommye: Oh, you are trying to get me in trouble—you are talking about tone now. Tone is not a craft element. One can't do tone—as some novice poets might believe. It is a mixture of craft elements: sound, syntax, image, and music. Do I think of these elements? You bet I do, but not all at once—I’d go nuts. At some point during my drafting, the form, not the structure of information, has to be dealt with—which creates these moments of discovery for me. By discovery, I mean those moments when the poem reveals to me something I did not know was there all along. This happens when formal and structural elements are in collusion, and collision, with each other. I suppose these tonal registers you are hearing are tied in with these moments of discovery for me. Kevin: In what ways has your writing process evolved? Tommye: I try to keep my drafts and sketches away from my laptop for as long as I can. You could have the shittiest poem, but when it is laid out in a nice and neat Word document, it looks precious and polished. No, I have always worked out my poems on paper for long stretches. But I will say that I am now more forgiving in the drafting stages. There was a time in which I could not make it past one sentence (I start with sentences—not lines) without scribbling it out. I’ve learned to let that go and embrace the errors. It’s the errors, which aren’t really, that get me to discovery and risk. Kevin: What have your experiences been like in getting your poetry published? Tommye: People have been very receptive to my work—and I do not take that lightly. For the most part, I live and write in solitude—like so many writers. It is always a joy and a shock to me when the poems I write are able to reach people I would never come in contact with otherwise. For me, that is the value of publication. When I hear some poets, further along, downplay awards and publications, awards they have been awarded, with countless publications under their belt, I roll my eyes. What poet does not love to be read? To be heard. If connection is not what one is after, then I would rethink why one writes. Kevin: What advice do you have for writers who are just beginning to submit their work for publication? Tommye: Don’t sit still! Submitting poems does not mean you should just sit there and wait for acceptance or rejection. Write, write, write. I do not believe in simultaneous submissions. If one sends out the same poems to different publications, they are not writing enough and are not ready to be submitting. When you finally do get a poem accepted, and that will happen, don’t think that poem can’t be revisited. Just because a poem is published, does not make it precious.